CAM provides the framework in which various application snap-ins reside for maintaining, controlling, reporting and processing credit and debit card transactions. Highlights of the CAM structure are user access and control and full transaction detail reporting including a report designer for your own bespoke credit and debit card transaction reports. Messages - displays any messages that are sent from Commidea or automatically from the data centre - for instance messages are sent indicating the failure of any system jobs that are run automatically. Accounts - holds details of the card processing accounts that are active on the system. These accounts will have been imported from the remote ICP servers and/or a local WinTI payment server. Management - controls user access to CAM via users and user group setup and manages the schedule of tasks that can run within CAM for updating the system and importing data for reporting. Local Reports - Provides reporting capability on transactions processed through Ilink or the ICP Text Interface. Ilink - provides chip and pin functionality by linking POS and Chip and Pin terminals with either the ICP authorisation service or a local WinTI authorisation server. Terminal Management - controls user access to chip and pin terminals via terminal users and terminal user groups. The updating of terminals with the latest software and changes to the configuration of terminals is also managed here. Transaction Reports - provides reporting capability of all transactions submitted to the bank up to Midnight on the previous day. Various standard reports are provided together with a report designer allowing you to create reports that include only the information you require. Generated report data can be exported in a number of different formats for use in other applications inlcuding: Adobe PDF, Excel, HTML, Rich Text, Text, Image-TIFF. Fraud Reports - provides reporting based on fraud screening factors and parameters. Live Store Reports - by contacting the central authorisation servers the latest transaction data authorised via ICP can be imported and reported on in the same way as the other CAM reporting modules. Offline Transaction Processing - provides the ability to submit transactions that have been offline authorised in times when online authorisation cannot be obtained. 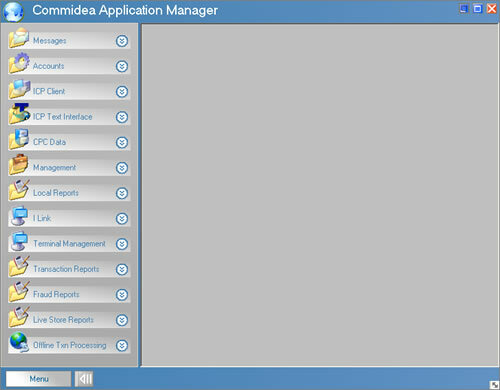 The CAM Components are shown below in the main CAM application window.